Devstream 86 is upon us! This Stream had a lot of things to touch upon, and a lot of visuals to share, so let’s just jump right into it. If you like to watch the shenanigans as they unfold (or meticulously compare this overview with what the Devs actually said - I don’t judge), be sure to watch the stream on our YouTube channel. If shenanigans aren’t your thing, the TL;DW version is available below. Be sure to play the 24-hour Gift of the Lotus Alert on all platforms! The Glast Gambit surprised us and was released early on consoles! If you haven’t entered the Prime Gaming Giveaway, do so! It ends Feb. 1. TennoCon is happening July 8th in London, Ontario, Canada. Tickets and hotel pricing will be revealed at a later date. Stay up to date at http://warframe.com/TennoCon. The Second Stream Podcast was recorded right after this Stream. Want to hear last Stream’s episode? You can listen to it here. In Devstream 71, we showcased concept art of a new Sentinel but there hasn’t been a lot of discussion about it since. Fifteen streams later, we have news to share! 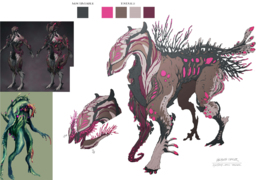 As previously revealed, this new Companion will be used to introduce Sentinels to new players, much like how the Howl of Kubrow Quest teaches Tenno about their furry friends. A potential mechanic for this new Companion is the ability to steal Health/Shields from enemies and give it to you to bolster early-game survivability. The first iteration of The Bard Warframe's Idles were shown last Devstream, but even more toe-tapping has taken place since then. [DE]Danielle was gracious enough to jump into the Mocap Studio and dance for us. Below you can see the footage of her dancing and a WIP version of her Agile Animation. The full video (with sound!) is available here! The team had more to show off for this new Warframe: her Sequencer V2. For those unaware, a Step Sequencer will be used to customize the sound of each of her abilities. Presets will be available for those who aren’t interested in designing their own tunes, but an idea of how this will work is showcased at this time stamp. If you want others to use your song, or to use one made by another player, we are hoping to let Tenno share their creations to allow for collaboration. The current sounds are placeholder, as we will be recording real musical instruments for this mechanic in the future, with the option to obtain different sound packs as well. Self or Team Buffs when Beat-matching your casts. A global tempo will be implemented to allow multiple Bards to beat-match each other. Damage output being tied to notes used, for customizable DOT or a single burst of hurt (with the damage being divided by the number of notes). Use of overall noise level to boost damage - strategically cast your powers in louder parts of the map vs quieter ones. Creation of a special emote that will allow you to play your entire song uninterrupted to show off or jam out with friends. We all appreciate your patience as we work out any kinks - we need to make sure that her abilities aren’t too repetitive to the point of being annoying (to yourself or others!). She will be coming with her own Quest, tied to the Cephalon Suda Syndicate. 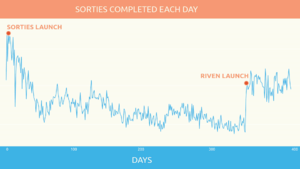 The above graph is a look at Sortie activity since their launch. As you can see, there was a gradual dropoff of Sorties with some fluctuation as Seasons were released. With The War Within and the Riven System, they are more consistently played. Hopefully, with the release of Melee Rivens (and therefore even better drop rates), this number will go up. Since there is a larger playerbase within the Sorties again, we want to add more variety: Assault and Infested Salvage will appear in the randomized missions soon. Remove endless stacking. Our team is also looking into further RNG concerns to hopefully prevent players getting the same Reward in a row, especially in long streaks. 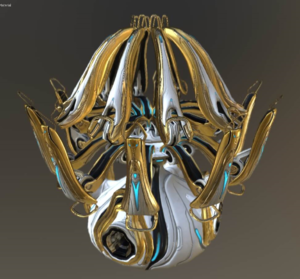 To make the 2K Endo Reward more palatable to all Tenno, we are replacing it with a Sortie-exclusive Ayatan Statue with a base worth of 2K Endo. Collectors uninterested in Endo can keep the Statue, and the Endo-hungry can either trade it for 2k Endo or get more Fusion-for-their-buck if they add in the Stars. Speaking of Ayatan, the credit cost for trading in Ayatan Statues to Maroo will be removed sometime in the future. This is the result of a greater look at the credit economy. Those of you who love the Secura Lecta, please know that the current chaining-bonus for extra credits is being revised. We want Credit Rewards to work better for everyone instead of those who use one weapon, so this whip will be rebalanced. TennoGen Round 7 has been announced! For links to all the winning submissions, visit our Forum thread here. 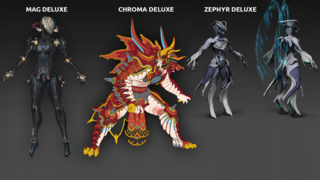 Mag, Chroma and Zephyr’s Deluxe Skins are still in the works! Mag and Chroma are coming along nicely; Zephyr is a passion project of a non-character artist who is currently very busy, and will be coming last out of this list. New Glyphs are coming soon, you can see them all in this imgur album. Some areas of the world were experiencing issues with “Network Not Responding” messages. It took us a while to track down the cause, but thank you to all of the Tenno in the community who helped us figure it all out! The Nullifier's bubble will be scaled with the geometry of the room so that the coming Weak Point will always be visible. This change will also help prevent clipping through walls in tight spaces. Need to see it to believe it? Well, watch on here. 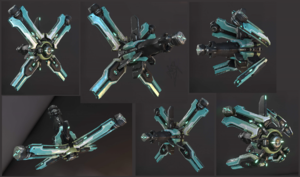 A new Spear Gun is coming, which will be more like the Opticor in its gun mechanics. Upon throw, it will tether enemies within a radius and deal electrical damage randomly with chance of shock proc. See it in action here. We mentioned this new system before The War Within was released, and made had progress on it before realizing we didn’t like the direction it was going in. Currently, we are looking into creating procedurally-generated enemy Cells for Clans to take on. They will scale with the size of your Clan and serve to create more long-term engagement with an enemy as you all work together in missions to take down the Kingpin. Rewards and ranking systems are still being discussed. Limbo’s dodge in-and-out of the Rift mechanic is coming along nicely. New animations were created to make this transition quick and easy. The Bo is getting a visual rework. We are looking into tweaking the Archwing orientation system to be less nausea-inducing for certain players. More controller options may be added, or the option to remove this mechanic altogether. We are looking into adding new or unique Mods to the Kuva Fortress! No out-of-game/chat Trading systems are planned. Dark Sectors are being worked on, we swear. Shield Gating is still in the works, but we are working on balancing it to prevent permanent invulnerability.